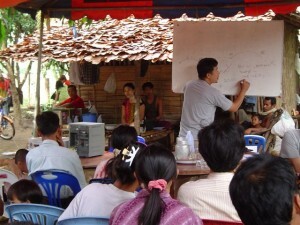 Saw Min Lwin is the project leader of the joint UnionAID –FTUB project in Mae Sot, Thailand. Min is well known to many unionists in Wellington because he spent six months here in 2003. Min is also the International Human Rights Director of the FTUB and has played a key role in gathering evidence of forced labour in Burma in support of the case to the International Labour Organisation over many years. The FTUB work in Mae Sot is a testament to his commitment and organizing skills. This includes our joint project and an FTUB school for children of migrant families.